First, that my executor hereinafter (named) shall provide for my body a decent burial, and attend to this will vowed. 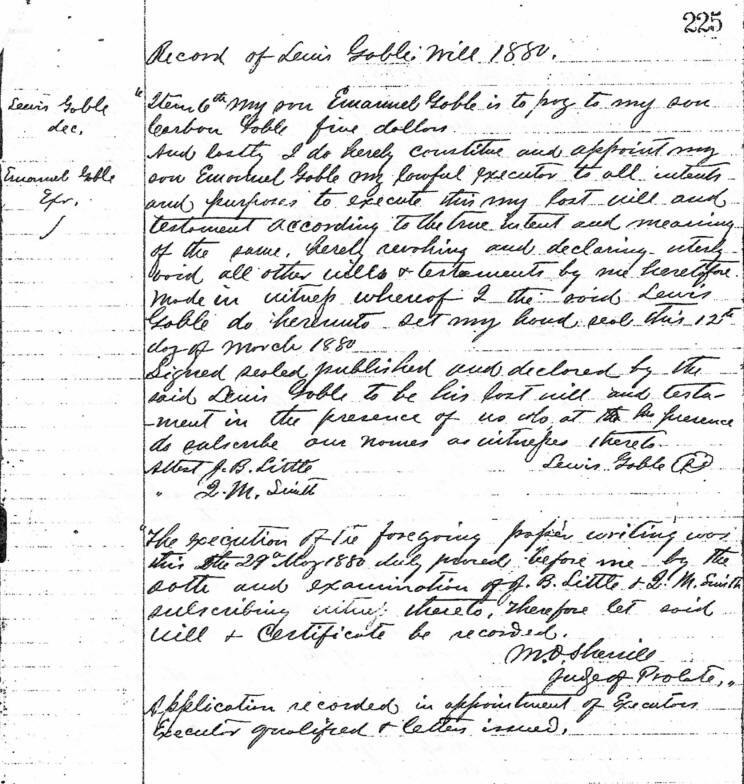 Item 1st, I give and devise to my son Emanuel Goble all my lands and the said Emanuel Goble is to maintain his Father & Mother during life and his sisters namely Delila, Elizabeth and Catharine Goble, as long as they remain single. Also the said Emanuel Goble is to maintain my grandson Jacob Hedrick as long as he wishes to remain with him. The above named children is required while they stay with my son Emanuel Goble to do all that they can to assist him on the farm and in the house to make a support. Item 2nd, I will and bequeath to my beloved wife Eva Goble, all my household and kitchen furniture of every description also one black horse, also two head of cattel (cattle) her choice, also all my sheep & hogs for the use of the family and all my farming implements of all kind for the use of the family now at home. Item 3rd, I will all the provision now on hand and the present crop to go to the use of the present family at home. 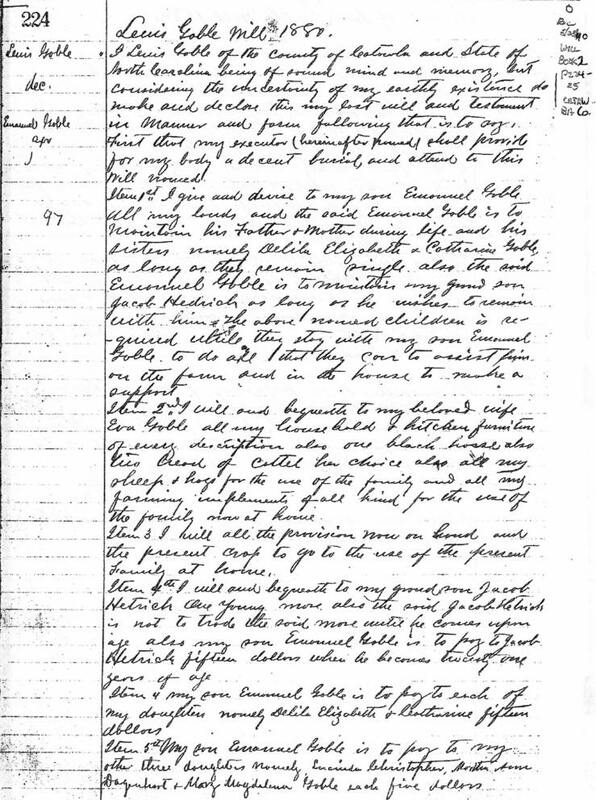 Item 4th, I will and bequeath to my grandson Jacob Hetrick (Hedrick) one young mare, also the said Jacob Hetrick (Hedrick) is not to trade the said mare until he comes upon age, also my son Emanuel Goble is to pay to Jacob Hetrick (Hedrick) fifteen dollars when he becomes twenty-one years of age. Item 4, my son Emanuel Goble is to pay to each of my daughters namely Delila, Elizabeth, & Catharine fifteen dollars. Item 5th, my son Emanuel Goble is to pay to my other three daughters namely, Lucinda Christopher, Martha Ann Dagenhart, & Mary Magdalena Goble each five dollars. Item 6th, my son Emanuel Goble is to pay to my son Corban Goble five dollars. And lastly I do hereby constitute and appoint my son Emanuel Goble my lawful executor to all intents and purposes to execute this my Last Will and Testament according to the true intent and meaning of the same, hereby revoking and declaring utterly void all other Wills & Testaments by me heretofore made in witnep (witness) whereof I the said Lewis Goble do hereunto set my hand seal this 12th day of March 1880. Signed sealed published and declared by the said Lewis Goble to be his last will and testament in the presence of us who at his presence do inscribe our names as witnepes (witnesses) thereto attest. The execution of the foregoing papers writing was this the 29th May 1880, duly proved before me, by the oath and examination of J. B. Little and Q. M. Smith subscribing witnep (witness) thereto, therefore let said will & certificate be recorded. Application recorded in appointment of Executors Executor qualified and letters issued. If you have photos or additional information about Lewis & Evi Goble, please contact me.